Visiting major monuments is a top priority when going on a trip! 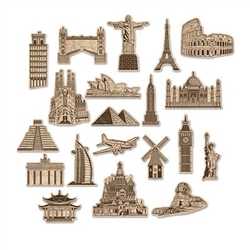 Decorate your international theme party or going away party with the Around the World Cutouts! They’re great for showing the places around the world you’re planning to visit, places you've been, or destinations on your bucket list! Place them around the room and these recognizable landmarks are sure to get your guest’s attention! Made of cardstock and printed on two sides. Sizes range in measurement from 7 inches to 10.5 inches. Contains twenty (20) pieces per package. Be sure to check out our large selection of international party decorations!